And so it is back to work. Oh yes, we can savor the moment for a while, for a few days, perhaps a week. But well before inauguration day we will need to be back on the job, in the community, in the streets, where democracy is made, demanding equity and justice in places where it hasn’t been seen in decades, if ever. Because for all the talk of hope and change, there is nothing–absolutely, positively nothing–about real change that is inevitable. And hope, absent real pressure and forward motion to actualize one’s dreams, is sterile and even dangerous. Hope, absent commitment is the enemy of change, capable of translating to a giving away of one’s agency, to a relinquishing of the need to do more than just show up every few years and push a button or pull a lever. The worst thing that could happen now would be for us to go back to sleep; to allow the cool poise of Obama’s prose to lull us into slumber like the cool on the underside of the pillow. For in the light of day, when fully awake, it becomes impossible not to see the incompleteness of the task so far. the above excerpt is from a recent post by tim wise entitled, "good, and now back to work: avoiding both cynicism and overconfidence in the age of obama." you can find the entire article here. if you aren't familiar with tim wise you are missing out. professor michael eric dyson of georgetown university has referred to tim as: "One of the most brilliant, articulate and courageous critics of white privilege in the nation." some praise. dyson by the way has been hailed as one of the most influential african-americans in the united states today. aside from the normal weekend chores there wasn't much work going on this weekend at avenue c - we're still enjoying a post-victory high and luxuriating in the absence of political advertisements and phone calls. no parties this weekend, but plenty of impromptu hanging out with family and friends. we returned to our normal saturday night routine of pizza and games. since there were four for pizza, this week we played cards. the pizza du jour was butternut squash pizza. I never used squash as a topping for pizza before, but let me say I sure will again. it was terrific and easy! earlier in the day I peeled a butternut squash, chopped it into chunks, sliced an onion, and put squash and onion in a baking dish. drizzled olive oil and seasoned with salt and pepper and roasted in a 400 degree oven for 30 minutes. 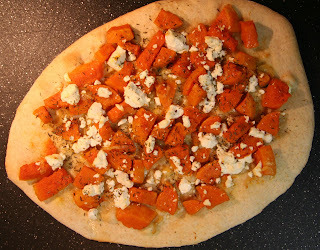 when it came time to make the pizza (we make our own dough) we rolled out the dough, lightly spread a bit of olive oil on top of dough, covered with roasted squash and onions, added crumbled goat cheese and seasoned with thyme. cooked in hot oven (450) until done (usually about 10 minutes). sunday was a laid back day. this weekend weather turned cold, in the space of a few days it seemed like we went from summer to fall to winter. except for a morning mission to oberlin I spent sunday making lasagna, reading, and quilting while listening to michael connelly's latest which we checked out from the library as an audiobook. since e had to work dixie came over to hang - which unfortunately confined the cats to the second floor for the day - but they didn't complain as there's plenty of nooks to sleep in or windows to look out in order to watch the outside activity. sunday night the kids came over for dinner. then e took dixie home and we went to bed so early I didn't even check out my 'sunday show' - but that's cool, if I'm really motivated e said I can catch it on the internet. I am so hungry for butternut squash pizza. Do you have a special pizza oven or do you just use a conventional oven? 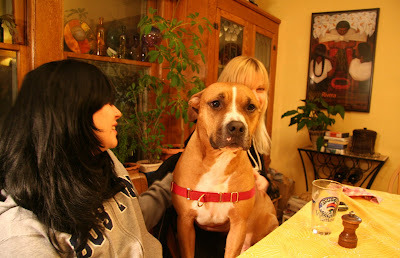 I also wanted to reach out and give Dixie a big hug. You know dogs are my favorite. But I did see Reds the cat on a leash at Sidamo today and he is making me look closer at the feline community. 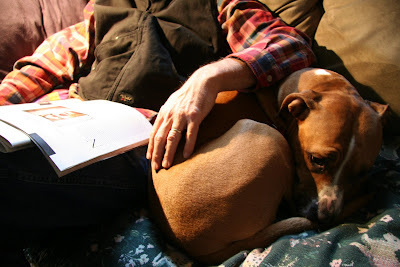 I assume that Dixie is the lovely creature snuggled up to the person reading? I'm curious about the red collar/harness and how well it works. There is a great butternut tostada receipe in Laurel's Kitchen. What is your favorite Sunday show? barbara - we just couldn't believe how yummy the pizza was! a couple months ago I used potato as one of the toppings on a pizza and I thought that was good! we just have a regular gas oven - no fancy brick pizza oven heated with wood or coal. I hope reds wins you over. junk - you're right that is dixie lying next to my f and she is quite lovely. e swears by the harness, sometimes when I walk dixie I get her front legs tangled up in the leash, but I think that's because I won't be paying attention e doesn't seem to share that problem. my show is brothers and sisters - what can I say, I've been a sally field fan from her days as gidget and the flying nun! Thanks for the link to Tim Wise, petite souris. What he says about turning a "singular event" (Obama's victory) into a social movement resonates strongly. That pizz looks great - definitely going to try it. Hey can you believe Oliver is one of my all time favourites? But of course you can! I am checking out the Tim guy. Squash pizza?! Now that's something you'll never find in Molfetta! 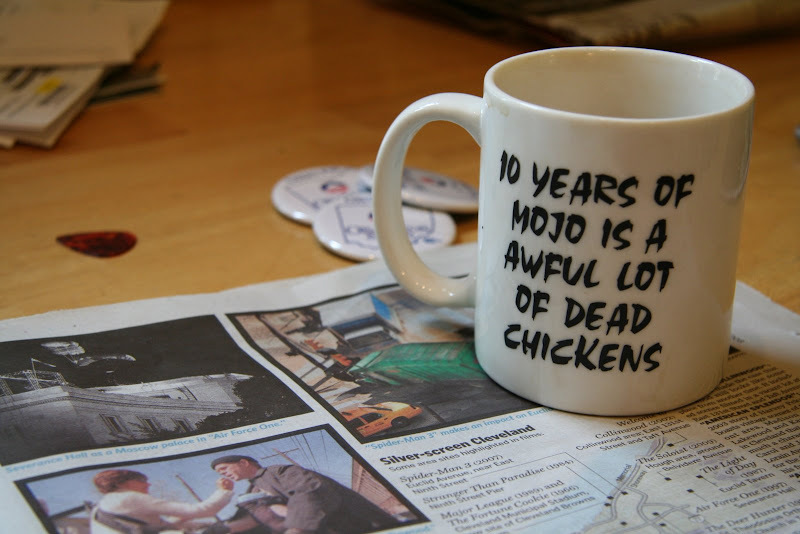 But, it sounds lovely, especially with the goat cheese...mmm! Yum, that pizza!I put roasted squash with some grilled poblanos and cheddar in a quesadilla, and it was so delicious it was disgusting. I'm going to try it on a pizza next.